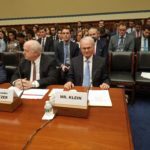 ZOA National President Morton A. Klein testified before the House of Representatives Committee on Oversight and Government Reform Subcommittee on National Security in July of 2018, where he urged the recognition of Israeli sovereignty over the Golan Heights. Click here to view Morton Klein’s written congressional testimony. Wash. News Article: ZOA’s Morton Klein and Amb. Dore Gold Testify Before Congress Urging U.S. Support of Israeli Sovereignty of Golan Hts.